Toobin’ is a unique fantasy-adventure game. 1 or 2 players can race Bif and Jet, the Toobin’ dudes, in their inner tubes, down 45 different rivers. The players try to keep Jet and Bif afloat, avoiding sharp objects, gaining points, and throwing cans at obstacles. Toobin’ appeals to both males and females of all ages who both find it just ‘fun to play’. Toobin’ has a continuous buy-in feature so players can join in at any time. Toobin’ has a color-coded control panel and players can identify Jet in the yellow inner tube and Bif in the black inner tube and red shorts. Each player has a set of four buttons to steer Bif or Jet forwards, backwards, and sideways. Pressing the two Paddle Forward buttons moves the inner tube forward. Pressing the two Back Paddle buttons moves the inner tube backwards. Pressing only one Paddle button makes the inner tube turn. The player uses the Throw Can button to destroy obstacles in the river and stun riverside pests. Toobin’ players can enjoy amusing game play and an incredible variety of rivers and environments for their long-term enjoyment. 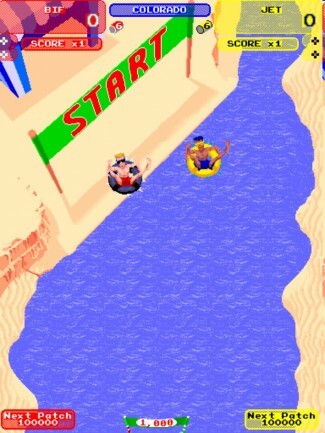 The player races Bif or Jet against other players, or against the game, down Toobin’s 45 different rivers, paddling through six classes of play, and cruising the 15 unique river environments. The player can choose almost 200 courses through the rivers, finding his own way through rapids, obstacles, riverside pests and waterfalls. The player has to guide Bif or Jet around obstacles, go through gates and pick up treasure to accumulate points to get more inner tube patches, collect cans to throw at obstacles and to stun riverside pests, and paddle fast enough to avoid the big ‘gator lurking in all the rivers. At the finish line, players are treated to a party. Each party grows in size until the player reaches the final super party at the end of the game. Inner-Tube Patches : At the beginning of each game, the player has a certain number of inner-tube patches, which represent game lives. A player receives extra patches by scoring the number of points required for another patch. The number of points required changes from level to level, and is displayed in the lower left and right corners of the playfield. A player can also receive more patches by picking up patches floating in the rivers. Cans : The player must accumulate cans to throw at obstacles and pests. All cans are the same value. The player can pick up individual cans floating in all the rivers or six-packs hidden under obstacles or in back waters (Six packs give unlimited cans). The player throws the cans by pointing Bif or Jet at the obstacle and pressing the Throw Can button. Most of the obstacles in the river can be eliminated by hitting them with a can. Dangers : The player must avoid or eliminate dangers in the river and stun pests on the river banks. The dangers in the river include falling rocks, floating logs, deadly falling coconuts, icebergs, mines, stampeding cattle, snakes, crocodiles, barbed wire, and thorny bushes. Dangerous riverside pests throw and shoot objects at Bif and Jet. The player can stun most of these objectionable characters with a can thrown in their direction. These pests include Casting fishermen, Hillbillies, Terrorists, Devils, Martians, Street punks, Pistolaros, Natives, Penguins, Bears, Dinosaurs, and Cavemen. Big ‘Gator : If a player is slow, the big ‘gator comes up from behind to discourage slow play and hurry the player through the gates. A loud thumping sound warns the player of its presence. One escape from the big ‘gator is to quickly paddle downstream or pass through a gate. If the gator catches Bif or Jet, one inner-tube patch is lost.